If you are looking for a lightweight, sheer coverage foundation then try this foundation. I loved using it in summers when my skin becomes really oily. It feels light and makes my skin look natural and even. It does not break me out which is the biggest bonus for me in this hot and scorchy weather. I love bright and bold shades on my nails and this nail color has stolen my heart. Get Reddy is a bright candy apple red color with red and golden shimmers infused in it. It looks lovely and pretty on nails and stays on my nails for a long time. No doubt it is one of my favorite RED POLISH I have tried! I was never been a primer person until I tried this Revlon Photoready Perfecting Primer. It makes my skin super soft, smooth and even. The foundation glides like a dream and quickly with no dry patches. My makeup stays on for a long time. It is a must have for all makeup junkies. I have been suffering from dry hands lately and I cannot think of myself without a hand cream. This cream is extremely light and makes my hands and cuticles really soft and smooth. It smells really good and oh my nails do not tend to break now with a little bang on the door. Though I am not a fan of coffee but I loved this face scrub to the core. It has a lovely and yummy scent of coffee. I actually feel like eating it. The granules are not abrasive and remove all dead cells from the skin making it look soft, smooth and even. Though I am not fond of bright lipsticks but I just cannot get enough of this shade. Peach Crush is a coral peachy pink color and instantly makes my face look bright and fresh. It has matte finish and glides smoothly on the lips. The pigmentation and staying power are superb! Colorbar Velvet Matte range lipsticks are must haves if you are a fan of matte lipsticks. My lips become all dry and chapped in summers due to less intake of water and Puro Body & Soul Lip Balm came at the right time. It not only makes my lips soft and hydrated but leaves a protective layer that keeps them hydrated for a long time. The strawberry scent is yummy and makes me to reapply it again and again. It is a lovely budget friendly foundation brush that blends my foundation evenly giving me a flawless finish. The bristles are really soft and apply the foundation really well. Though it needs a lot of work to get streak less finish but the results are pretty awesome! Now coming to the giveaway! In order to celebrate the birth of my nephew, Tejinder di’s son, reaching the 500+ Facebook fans and few more I really thought hard what to give away as a token of appreciation to my readers but got really confused! So I thought what can be better than giving away the things I liked a lot! 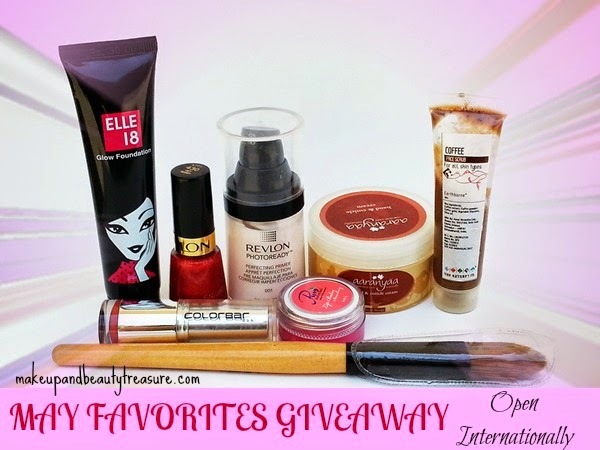 The giveaway is INTERNATIONAL and I would be giving away all the 8 favorite things I mentioned above. There will be only winner and would get all the brand new items. I have the sample size of The Nature’s Co Coffee Face Scrub but the winner would receive the full size. Without further ado let’s jump to the rules! • There are 3 mandatory entries and you need to complete them to be considered. • All the products shown in the picture are mine. The winner would get brand new products. • Giveaway ends on 25th June 2014. A winner will be chosen randomly on 26th June and would be notified via email. The winner must reply back within 48 hours of winning or a new winner would be chosen.